For authority on what constitutes domicile, consult the Domicile Act No. 3 of 1992. It is trite law that in the absence of a properly executed antenuptial contract, the patrimonial consequences of the marriage of a male, domiciled in the RSA, who marries a female from any country, anywhere in the world, will result in the marriage being governed by the law of the RSA, and the patrimonial consequences of the marriage will be one of community of property, and community of profit and loss. It is likewise elementary law that in order to avoid the patrimonial consequences of a marriage in community of property and community of property and loss, the parties to such a marriage must conclude an antenuptial contract prior to the date of marriage. Where the marriage is concluded on the same day as the antenuptial contract is executed, then a prudent notary would disclose both the date and the time of execution of the antenuptial contract – in order to substantiate that the antenuptial contract was in fact executed prior to the date of the marriage. It is not sufficient for the parties to the intended marriage to merely sign a power of attorney authorizing an agent to appear before the notary public – prior to the date of the marriage – and to execute the antenuptial contract on their behalf. The date of the signing of the power of attorney is immaterial – and unless the antenuptial contract is executed by the agent in the presence of the notary prior to the contacting of the marriage, the antenuptial contract will be invalid and void ab initio, and the patrimonial consequences of the marriage will be one of community of property and community of profit and loss. (In these circumstances section 88 of the Deeds Registries Act No. 47 of 1937 (the DRA) would be applicable – see below). Section 87 of the DRA requires an antenuptial contract to be registered in the deeds registry within three months of the date of its execution. Failure to register the antenuptial contract within that period will require an application to Court in terms of Section 87 of the DRA – seeking an extension of time from the Court for the registration of the antenuptial contract in the deeds registry. It goes without saying that this section is only applicable to an antenuptial contract which was properly attested and executed prior to the date of the marriage. Section 88 of the DRA contemplates an entirely different scenario. This section provides for the execution of a postnuptial contract having the effect of an antenuptial contract. Such a postnuptial contract requires an order of Court for its execution and registration. This section is completely distinguishable from the provisions of Section 21 of the Matrimonial Property Act no.88 of 1984 (the MPA). Section 88 of the DRA contemplates a situation where, prior to the date of conclusion of the marriage, the parties had agreed that they wished to exclude community of property and community of property and loss from their marriage, but for some or other reason did not do enter into an antenuptial contract prior to the date of the marriage. Just some of the examples where Section 88 finds application are where the parties duly signed a power of attorney appointing an agent to execute the antenuptial contract on their behalf but where, due to an oversight on the part of the agent or the notary public, the antenuptial contract was not executed by the agent prior to the date of the marriage. Other instances may include getting wrong legal advice about the legal requirements for the valid execution and registration of an antenuptial contract (usually around the braai fire or in the pub!) – including the common but mistaken belief that the parties have three months after the date of the marriage to conclude an antenuptial contract. Section 88 of the DRA therefore finds application in circumstances entirely different from the circumstances contemplated in Section 21 of the MPA. Moreover, all too often when briefed with an application to court involving the registration of an antenuptial contract in the circumstances contemplated in section 88 of the DRA, junior counsel invariably reacts with (incorrect) advice to make application in terms of section 21 of the MPA – instead of section 88 of the DRA. The notary needs to guide counsel on this issue, and must insist on the application being brought in terms of section 88 of the DRA. This section provides for the situation where parties were duly married to each other – at any point in time – in accordance with the marital regimes which they elected to adopt at the time of the marriage – but who now wish to alter the matrimonial regime which applies to their marriage. To put it in another way; the parties have now reconsidered the matrimonial regime which they agreed to prior to the date of conclusion of their marriage, and they now wish to change that regime. Clearly, in this instance, neither Section 87 of the DRA (obviously) nor Section 88 of the DRA can possibly be applicable. 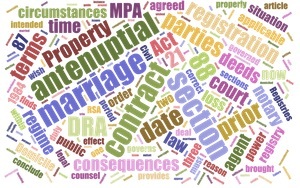 Section 21 of the MPA will require the parties to the marriage to depose to a founding affidavit to the effect that they have elected to change the marital regime which they had previously agreed upon prior to their marriage, and is therefore clearly distinguishable from the situation contemplated in Section 88 of the DRA – where the parties had, right from the outset, intended their marriage to be governed by the terms of an antenuptial contract entered into prior to the date of the marriage – but for some or other reason – this was not done. Section 21 of the MPA and section 88 of the DRA are not ‘’inter-changeable’’, so to speak. The parties do not have an election on whether to approach the court in terms of section 88 of the DRA or in terms of section 21 of the MPA. For the reasons set out above, it is vital that, before any application to Court is made, for the registration or execution and registration of an antenuptial contract, the different requirements of the three sections above be fully understood, and that application be brought in terms of the correct section of the correct Act. What marital regime governs two parties to a marriage who validly entered into an antenuptial contract prior to the date of marriage – but where the antenuptial contract was never registered in the deeds registry as required by section 87 of the DRA, and where the time period for registration has since lapsed? I will deal with this and other issues in my next article, and will also refer readers to a few very important court cases involving the execution and registration of antenuptial contracts. *Copyright in this article is reserved in terms of the Copyright Act, 98 of 1978. Neither this article, nor any part of it, may be reproduced, stored in any retrieval system, or transmitted in any form or by any means, whether electronic, mechanical, photocopying, or recording or in any other way, without the prior written consent of the author.